Lad Cerny, 33, an editorial artist for the Cleveland News since October 1934, died yesterday in St. Luke's Hospital. Mr. Cerny, who lived at 3521 W. 97th Street, entered the hospital on Monday for an operation which was performed on Wednesday. His wife, Bernice Cerny, arrived at the hospital a few minutes before he died. Most of his life had been devoted to art and he was a frequent contributor to the May Show at the Cleveland Museum of Art. In 1933 one of his works, a drawing of his mother, won him a prize. Early this year he received an award from the Cleveland Newspaper Guild for his art layout. His art education was received at the Cleveland School of Art and the John Huntington Polytechnic Institute. He was also a graduate of Benjamin Franklin School. Surviving Mr. Cerny, besides his wife, are his mother, Mrs. Dorothy Cerny, now in Czechoslovakia; a daughter Kay, and three brothers, James, Joseph and Frank Cerny. Charles F. Nelan was born in Akron, Ohio, reportedly on April 10, 1859. The date of his birth was published in newspaper obituaries, such as the New York Tribune and Geneva Daily Times (New York) on November 23, 1904. The obituaries were premature; he lived another two weeks. Artists in Ohio, 1787-1900: A Biographical Dictionary (2000) has the same birth date and his middle initial. However, the 1860 U.S. Federal Census recorded Nelan as four years old. (Ancestry.com transcribed the family name as "Nelson".) If Nelan's birth was in April then he was four at that time, because the census was conducted in June. His actual birth year was 1856. He was the second of four children born to Daniel and Catherine, both Irish emigrants. They lived in Akron. "…Mr. Nelan made pencil marks upon the fly-leaves of his father's books at Akron, O., long before he learned anything about perspective or proportion. He is, therefore, a native of Ohio, a State that has shown a purpose to be known as the mother of cartoonists as well as Presidents. Mr. Nelan studied technique at the National Academy of Design, New York City, and his work bears the marks of that training…." The annual awards of merit to the classes at the National Academy of Design are as follows: …Antique School—First prize, the Elliot silver medal, G.R. Boynton; second prize, the Elliot bronze medal, Charles Nelan; honorable mention, Miss B.A. Riker, J. Hoey and Hobart B. Jacobs. An exhibition of School drawings is now open free in the parlors of the Academy. The Akron newspaper, The Summit County Beacon noted this item on May 30, 1877, "Charles Nelan, the artist, has just finished a fine crayon portrait of the late J.O. Wolcott, of Tallmadge, which may be seen in West & Hale's window." "…he was listing himself in the Akron directories as 'artist,' and by 1881 he had opened a professional studio there, where he advertised 'Fine Artistic Crayon Portraits' through 1886. In 1887 he was employed as a draftsman at the Werner Lithographing Company, Akron, and was also managing the family grocery store. The following year he moved to Cleveland…"
Tibbals said, "...Being a close observer and possessing a keen appreciation of the ridiculous, he has always leaned toward caricature. His first work was done for Cleveland Town Topics and the Cleveland Press…" The date of his marriage is not known. The Summit mentioned his wife on October 9, 1889. The Cleveland Directory 1889 had this listing: "Nelan, Charles, artist Pictorial Engraving Co. r. 63 Parkman". A different listing was in the Cleveland Directory 1890: "Nelan, Charles, artist The Press. r. 7 Sawtell ct." The Cleveland Plain Dealer reported the formation of the Society of Artists in its October 10, 1891 edition. Nelan became a member of the professional artists' group. His wife, Olive Luella, passed away on May 20, 1892 according to the Plain Dealer. She was twenty-six. He continued at The Press and lived at 99 Arlington, as listed in the 1893 directory. The following year he resided at 33, Hazard. The Plain Dealer reported, on July 11, 1894, Nelan's eminent move to New York. A Banquet in Honor of Nelan. The Golgotha club entertained one of its members, Mr. Charles Nelan, the artist, at The Hollenden last evening with a dinner and reception. Mr. Nelan leaves shortly for New York, in which city he will be engaged in newspaper work. The menu was excellent; Old times were discussed and informal addresses delivered. The affair was a very pleasant one. Fourteen months later, on September 22, 1895, the Plain Dealer said, "Mr. Charles F. Nelan, well known in this city, had become the official cartoonist of the Scripps-McRae league, with headquarters at St. Louis. Mr. Nelan was recently on the art staff of the New York Herald." The August 22, 1897 Plain Dealer printed news of his marriage. Wedding of a Cleveland Man at Cincinnati Last Night. Charles Nelan, the well known cartoonist, and Miss Madge Kennedy were married this evening at the home of the bride's parents, No. 3342 Fairfield avenue. Many friends of the couple and their families were present. Miss Kennedy is also an artist of much note. Her specialty, unlike her husband's, however is china painting. She is a graduate of the Cincinnati Art school. 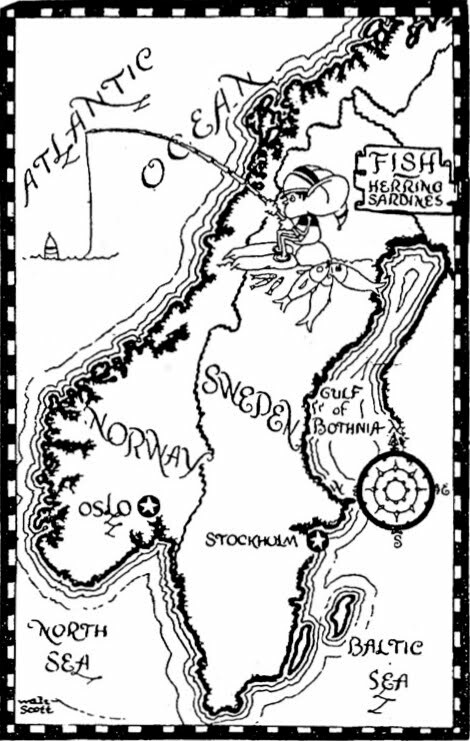 In the fall of 1898, Nelan's book, Cartoons of Our War with Spain, was published. 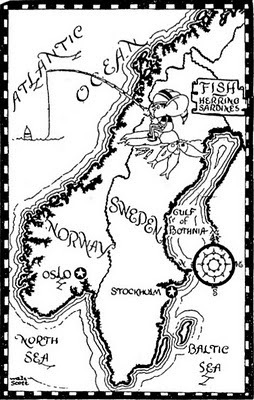 The book was a compilation of his New York Herald cartoons. …Later he accepted a position on the Philadelphia North American, and here occurred an incident in his career that attracted unusual attention. A series of cartoons appeared in the North American in which the Governor was represented as a parrot doing various amusing, not to say extremely undignified, things. These cartoons so incensed the candidate that, upon his election, he recommended in his inaugural address the introduction of a bill to limit the use of political cartoons. This was called the "Press libel law." Speaking of Mr. Nelan's cartoon which caused the bill to be introduced, the Governor said: "An ugly dwarf, representing the commonwealth, stands on a crude stool; the stool is subordinate to and placed alongside of a huge printing press with wheels as large as those of an ox-team, and all are so arranged as to give the idea that when the press starts the stool and the occupant will be thrown to the ground. Put into words, the cartoon asserts to the world that the press is above the law, and greater in strength than the government. In England a century ago the offender [Mr. Nelan] would have been drawn and quartered and his head stuck upon a pole without the gates." Mr. Nelan wrote the Governor a letter, in which he demanded a retraction, which was given in a public note. This is the first instance in the United States in which a political cartoon has been legislated against. 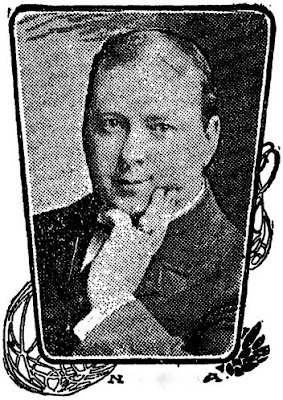 Mr. Nelan is at present connected with the staff of the New York Globe. That cartoon and accompanying article can be viewed here. The Plain Dealer published news of his ill health, which began in the summer of 1904. A doctor recommended a stay in the Adirondacks. Nelan stayed there but the cold October weather was unbearable, so he returned to New York for a few days. He headed south and settled in Cave Springs, Georgia where he passed away on December 7, 1904. He was to be buried in Akron, according to the Plain Dealer, December 8, 1904. The complete text of The Editor article is here. 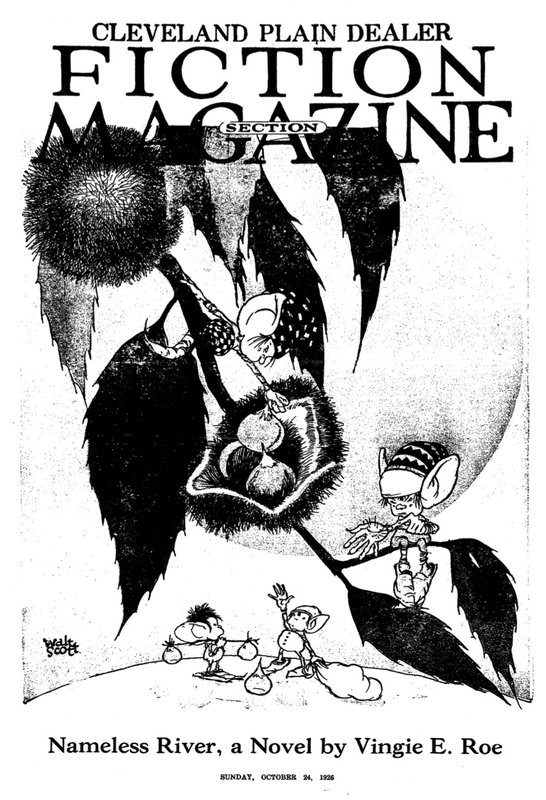 A Cartoons Magazine 1913 profile is here. The Grand Comic Database detailed the contents of the January 1914 Cartoons Magazine: "Clifford B. Knight tells of how he was unable to obtain cartoonist Charles Nelan's drawing table from his lawyer, but instead met his widow, Mrs. Nelan. From her he found that it was she, and not her husband, who drew the faces of women in his cartoons." Jeanne L. Harris was born in Lexington, Kentucky on July 22, 1905, according to the Cleveland Plain Dealer obituary and the Social Security Death Index. In the 1910 U.S. Federal Census, she was the fourth of six children born to George and Ann. They lived in Lexington, Kentucky. Her father was a clergyman at a Catholic church. Harris was Plain Dealer promotion art director for nine years and creative director for a year. She was art director for the Higbee Co. and a freelance artist before coming to The Plain Dealer…. 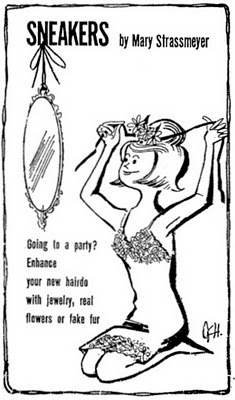 …She illustrated "Sneakers," a cartoon featuring grooming and deportment tips; "Easy Etiquette," cartoon which focused on the do's and don'ts of daily personal relationships, and "Camping Tips." She continued "Easy Etiquette" after retirement…. Sneakers, a weekly panel, was written by Mary Strassmeyer. The panel debuted on September 12, 1964. 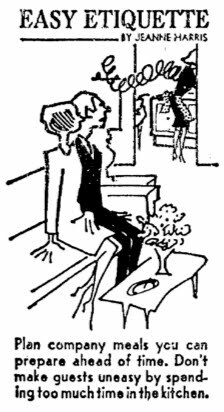 In the Plain Dealer Magazine of May 16, 1965, Harris and Strassmeyer's cartoon was touted for being picked for syndication by King Features. Beginning on February 28, 1969, Sneakers was published three times a week, Wednesday, Friday and Sunday. On November 18, 1970, the Plain Dealer reported, "Sneakers has a new look…[and] has changed in appearance and content. The drawings are brighter, the captions contain more information and the ideas are coming from teen-agers themselves." 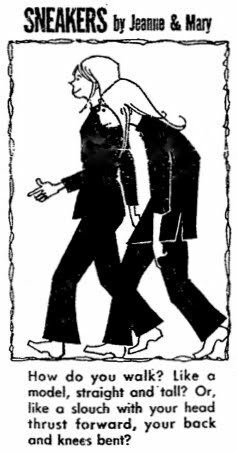 Easy Etiquette debuted on Sunday, January 8, 1967 in the Plain Dealer. On the tenth, the paper announced, " 'Easy Etiquette,' a new cartoon feature will appear three times a week in The Plain Dealer." In October 1968 it was picked up by the Register and Tribune Syndicate, according to the Plain Dealer on October 20. The first Easy Etiquette, 1/8/1967. Family Camping Tips (published as Camping Tips in some papers) began on March 17, 1967 in the Plain Dealer. It continued to appear papers as late as 1984. The first Family Camping Tips, 3/17/1967. Harris passed away on October 27, 1973 in Cleveland, Ohio. Her death was reported in the Plain Dealer on October 29. John Rai McGaw was born in Phoenix, Arizona on September 4, 1896, according to the California Death Index, 1940-1997 at Ancestry.com. According to a family tree at Ancestry.com, he was the only child of William and Minnette, who died before the 1900 U.S. Federal Census. In the census, he lived with his grandparents, Charles and Martha Jenkins, and their children. They lived in Columbus, Ohio at 1364 Summit Street. Apparently, William gave custody of his son to his in-laws. He lived in Columbus with his father. In 1910, McGaw remained in Columbus but at a different address, 169 Chittenden Avenue. He lived with his grandfather and Aunt Clara. His father had remarried and lived in Columbus. Information on his education and art training has not been found. He was a boy scout and his talent was noted in Boys' Life magazine. The May 1912 issue published news of the awards by the National Court of Honor: "…Three boys in Columbus, Ohio, John R. McGaw, George Sturgeon, and George A. Siebert, have won merit badges…" The issue dated December 1912 had a list of "Merit Badges Awarded by National Court of Honor" which included McGaw's badges for "Art, Public Health, Signaling and Swimming". A World War I draft card has not been found for him. According to the family tree, he married Winnifred Dorthea Colgrove on February 9, 1918, in Toronto, Canada. The 1920 census recorded him in Columbus at Columbus 23 North High Street. He was a commercial artist in the newspaper industry. His father was married to his Aunt Clara; they lived with their son Joseph, her father, and his aunt in San Diego, California. The family tree said his father passed away in 1926. The ninth annual exhibition of Cleveland artists and craftsmen was held at the Cleveland Museum of Art in April 1927. McGaw won first prize in the illustration class, as reported, by art critic Grace Kelly, in the Cleveland Plain Dealer on May 1, 1927. Two years later in the April 29, 1929 Plain Dealer, he was awarded second prize in illustration at the May Show. In June his work was shown at the Kokoon Club, and Kelly wrote, "John McGaw's illustrations looked strong and human." In 1930, McGaw, his wife and seven-year-old son Gordon lived in Shaker Heights, Ohio at 3326 Lansmere Road. He occupation was magazine illustrator. 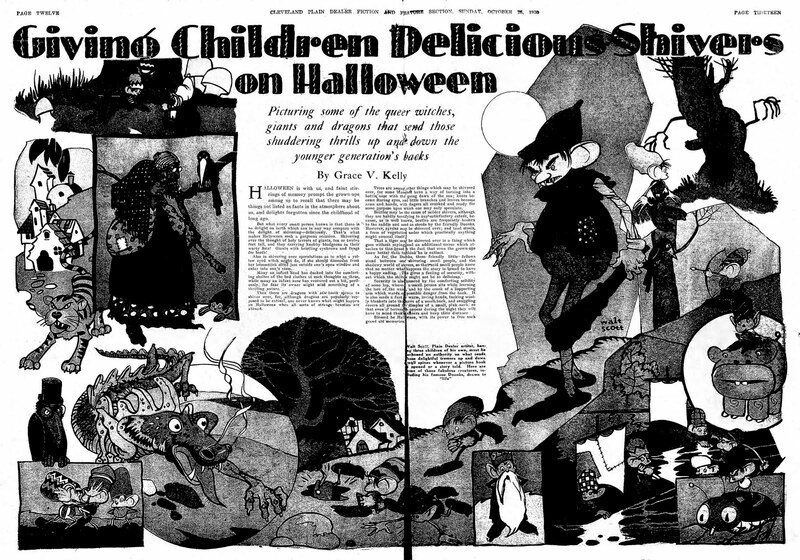 His illustration "In Chinatown" was noted by Kelly in the May 25, 1930 Plain Dealer. In January 1933, the Cleveland Museum of Art exhibited original cartoon art and caricatures by 90 artists. The exhibit included work by 15 Clevelanders including McGaw's caricatures from the Cleveland News, according to the January 15, Plain Dealer. In 1935 he was one of two cartoonists who drew the panel Local Oddities. 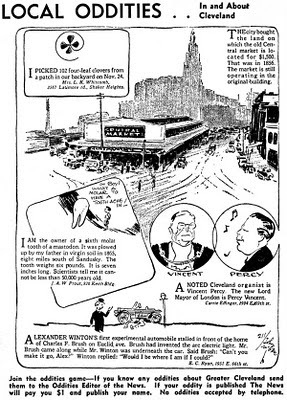 One of McGaw's Cleveland Press cartoons (1936) is at the Cleveland Centennial site. He signed his World War II draft card on April 27, 1942. His employer was the Cleveland News. His description was five feet eleven inches, 190 pounds, brown eyes and hair. The original art for his 1944 cartoon, "The Only 'Indispensable' Man", is at the Wolfsonian. 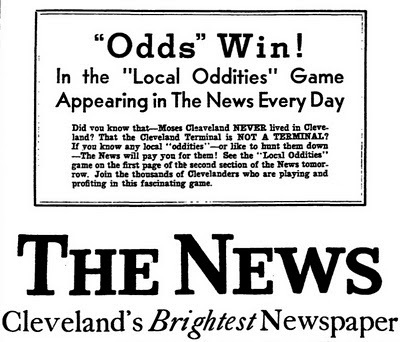 On May 9, 1944, the Plain Dealer announced the results of the Cleveland Newspaper Guild Awards. BEST CARTOON—To John R. McGaw, Cleveland News, for an editorial cartoon captioned "The Forgotten Man," which depicted the plight of a family with children attempting to rent living quarters in Cleveland. That cartoon was exhibited in the annual May Show at the Cleveland Museum of Art. The date of his move to San Diego is not known. He may have retired there because of his relatives. Aunt Clara passed away there on August 2, 1967. McGaw passed away February 12, 1969 in San Diego. His wife Wynn passed way December 18, 1974, in Newport Beach, California. On November 7, 1977 his son Gordon passed away in Newport Beach. Thank you so much for this account of my grandfather, John R. McGaw. I grew up with him in Coronado, California, until his death in 1969as you noted. He moved there in the fall of 1960. I'd like to add that he had no WWI draft card because he could not wait for the U.S. to enter the war and eagerly went to Canada and joined the Royal Air Force through the help of a Canadian relative. A training flight which ended in a crash nearly ended his career, and practically his life. He was in a coma for thirty days and doctors wanted to amputate his injured hand, but his father refused - a great blessing for his later career as an artist. He worked as an illustrator in the civil service until a month before he died, enjoying top security clearances but also doing illustrations for promotional posters for the base. He somehow managed to keep working well past the official retirement age. His daughter, my mother, Lorna McGaw, died in 2004. She was also a talented artist and in later years sometimes drew female figures for him to use in his work at North Island. My mother told me he also drew on the Green Hornet strip for a time in the 1940s. I also was told he drew a very popular series of portraits of WWII military commanders which were given as a premium for War Bond purchases. I'd love to know more about both these projects if anyone has information. I was very young when he died but he remains the best man I have ever known, very hard-working, upright and strong. Donald Bedell Wootton was born in Mt. Vernon, Ohio on January 15, 1896, according to the Ohio, Births and Christenings Index, 1800-1962, at Ancestry.com. In the 1900 U.S. Federal Census, he was the oldest of two children born to Harry and Ada. They lived in Mt. Vernon, Ohio at 800 West Chestnut Street. His father was a hotel clerk. ...In 1911—he was then 15—the family moved to Detroit. There Wootton first saw his boyhood idol, Ty Cobb, after whom Mr. Wootton patterned his baseball style when the family returned to Mt. Vernon and he began playing semi-pro ball. With the semi-pro team he toured Ohio towns, meeting with such success that a major league team expressed an interest in him. But on the day he was to try out with the team he was drafted into the Army. At Ancestry.com, Ohio Soldiers in WWI, 1917-1918 recorded Wootton's National Army enlistment date as April 27, 1918. He was assigned to Company C, 330 Infantry, 158 Depot Brigade. With the rank of private, he was honorably discharged on December 19, 1918. The date of his move to Cleveland, Ohio is not known. Ohio Art and Artists (1932) said Wootton studied at the Landon School, in Cleveland, and the Cleveland Art School. The Plain Dealer said, "Mr. Wootton was a member of the editorial art department of The Plain Dealer for seven years after his discharge from the Army following World War I." He also created a Sunday strip By the Way which ran from June 29, 1919 to May 27, 1923. 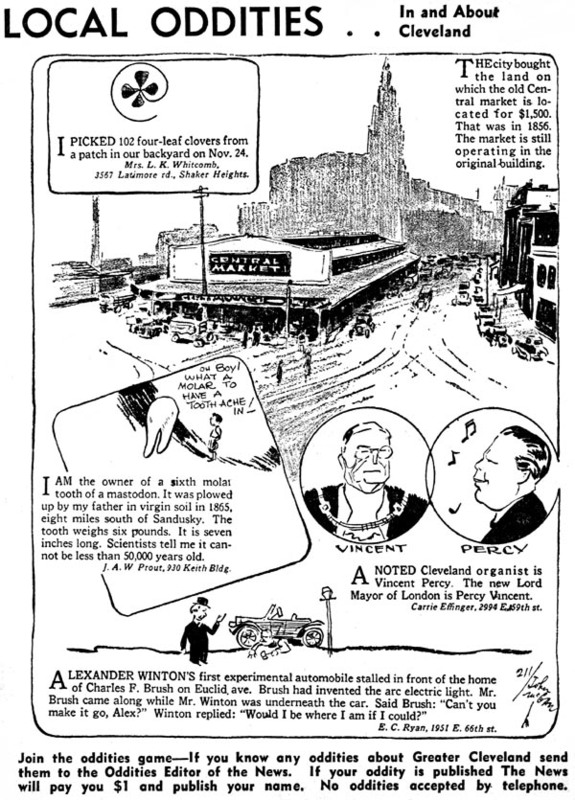 The 1920 census recorded Wootton, a lodger, in Cleveland at 1898 East 82 Street. His occupation was newspaper cartoonist. At the same address was illustrator Rico Tomaso. He married Ruth Ellison in Cleveland in 1924, according to the Plain Dealer. The book Our Brokaw-Bragaw Heritage (1967) said she was an English portrait painter. The Plain Dealer said, "Leaving The Plain Dealer, Mr. Wootton became art director of the [Cleveland] Press. He later was with the Newspaper Enterprise Association for a time." In 1930 the couple lived in Cleveland at 4209 Euclid Avenue. He was an artist for commercial journals. Ohio Art and Artists included Wootton's explanation of how he made caricatures. The best place to pick up sketches of prominent men is at their favorite restaurants during the lunch hour. I have often made rough sketches of some well-known man while seated a few tables away from my victim. When unconscious that he is being sketched, his expression is entirely natural and at such moments the best likeness can be secured. I depend a good deal upon memory to get the form of features of each individual. I depend a good deal upon memory to get the form of features of each individual. Sometimes I do not make a sketch at all, but draw my impression of the face when I return to the office. At first I worked for caricature of the face only. Now I include every peculiarity of his person and even his most characteristic postures. I believe that these things are as truly characteristic of him as his features, and are as easily recognized. The Plain Dealer said, "He then worked for the D'Arcy Advertising Co., leaving there last year  to open his own studio." Wootton passed away on April 18, 1962, in Mt. Vernon, Ohio. His tragic death was reported in the Plain Dealer two days later. Donald Bedell Wootton, an editorial artist whose caricatures of the well known enlivened Cleveland newspapers for two decades, died yesterday in University Hospital in Columbus. He was 66. Mr. Wootton's death was the result of a gunshot wound, self-inflicted in a park near his Mt. Vernon, O., home on Sunday. Usually happy but sensitive, he had been worried of late about the success of an art studio he had opened last year at 4300 Euclid Avenue, his wife, Mrs. Ruth Wootton, said…. He was buried at the Oak Grove Cemetery in Gambier, Ohio. I was wondering if you could tell me if Jim Ivey accepts money orders? I would like to get one of his books and I don't know if he has an email or not. I hate to send a letter to him with just that one question on it. You can order Jim's books online at lulu.com. Sad. My dad's cousin, still remembered for his art and humor. Walter Emil Scott was born in Sandusky, Ohio on August 9, 1894, according to the Ohio, Births and Christenings Index, 1800-1962 at Ancestry.com. In the 1900 U.S. Federal Census, he was the third of four children born to Walter and Amelia. They lived in Sandusky at 420 Tyler Street. His father was a railroad clerk. Ten years later they were at the same address. His father was a pottermaker at a foundry. In the March 23, 1930 Cleveland Plain Dealer, art critic Grace V. Kelly wrote, "…[Scott] came to Cleveland in 1916…he studied some in the night classes of the Cleveland School of Art, and before coming to the Plain Dealer did commercial art, sharing a studio with Joseph Jicha…." He signed his World War I draft card on June 5, 1917; the card included his middle name. He was an advertising artist, described as tall height, slender build with blue eyes and brown hair. He resided at 9400 Euclid Avenue. "…after a short stretch with the drawing board at the Press, he joined the Plain Dealer and stayed 13 years. Here he met the late Gordon Barrick, nationally-known artist and Plain Dealer art director. "What little I know about art came from the teaching, patience and kindness of 'Doc' Barrick…"
He was on staff at the Plain Dealer as early as November 1922; he contributed a background illustration, of pilgrims rowing boats from their ship and coming ashore, to the Sunday Magazine cover, dated November 26. 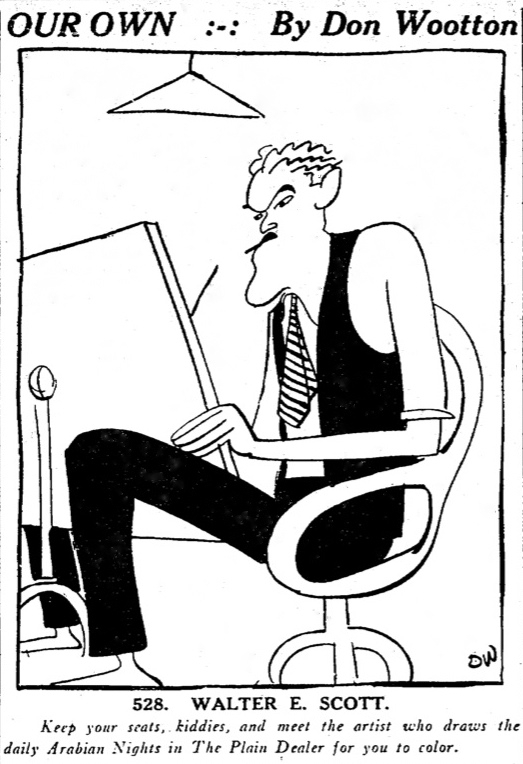 Staff artist Don Wootton's drawing of Scott was published on October 29, 1924 (below). 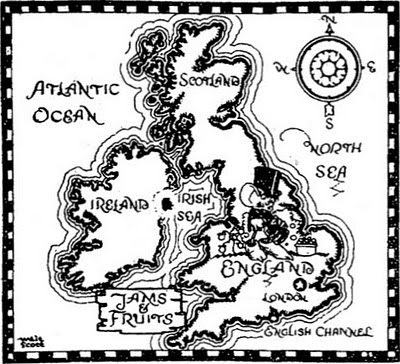 In 1926 Scott illustrated Dramatic Events in Bible History. 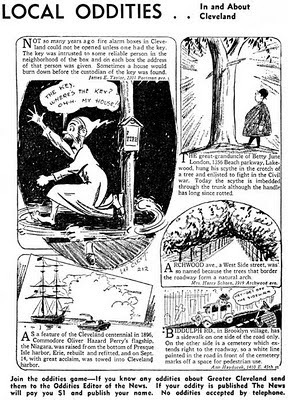 He produced the Sunday featureThe Doonks in early 1933, but its origin can be traced as far back as an October 24, 1926 Plain Dealer Fiction Magazine cover (below), and to 1925 as original art (second below) that may have appeared in the Plain Dealer, or have been exhibited in local galleries. Did I hear you bemoaning the fact that all your friends were going abroad this summer? And do you feel so stay-at-home-ish and aggrieved? I know. I feel that way too. Suppose we take a culinary trip this summer. "My mind to me a kingdom is" may be true, but "my palate to me all Europe is" can be equally true. Walt Scott, one of the artist on the Plain Dealer staff, has drawn a series of maps showing the doonks of various countries. A doonk, you may or may not know, is a creature of Walt Scott's imagination and brush. Doonks live in Doonkland, a country which Mr. Scott had shown in one of his paintings on exhibit in the current May show at the Art Museum. But doonks are international and cosmopolitan. If you look closely at this map, you will see the doonk who inhabits France. He looks well fed. Why shouldn't he be, since he is in the culinary capital of the world? Suppose we travel with the Doonks this summer and see just what their fare is in the various countries. Today, we are in France…. 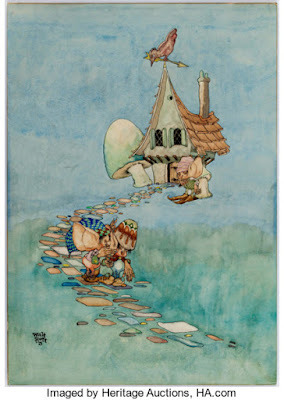 ...About 25 or 30 water colors and etchings will be shown, and besides "The Doonks," the subjects will deal with pirates, treasure chests, yellow-eyed witches and what not. I said they would be entertaining for the children, but, after all, I do not know why I should limit my remarks to the younger generation. For they are so entertaining to me that I can not see why all the grown-up world should not be entertained by them. Especially since they are all designed upon the soundest art principles and executed as a good craftsman should turn out work…. …His fairy story pictures came into being during a bad commercial art year, when he had lots of time on his hands. The theme was so much to his liking that he has carried it on ever since in an infinite variety of form…. …Some of the first numbers will be shown of a comic strip he is creating, and which is the only known comic strip, addressed exclusively to children. The entire Doonk family is used in this, as well as those with whom the Doonks come in contact. Seven months later his Doonks and other creatures were featured in a two-page Halloween spread (below) in the October 26 Plain Dealer. In the 1930 census, Scott lived in Lakewood, Ohio at 1560 Robinwood Avenue. He was married, since he was 26, and had three children. His occupation was newspaper artist. The Doonks finally arrived in the comics section in February 1933. A Plain Dealer Sunday paper ad, in the Saturday, February 18 issue, included this line: "…There's a new feature which children will love—"The Life of the Donks [sic]," a beautiful pictorial by Walt Scott." The May 4, 1956 Plain Dealer, said, "In 1935 he joined the Newspaper Enterprise Association, and next came several years in California with the Walt Disney and other cartoon studios. His first love, illustrating, called him back to NEA in 1943." He produced Songs of Christmas, in 1951. His other NEA Christmas strips can be viewed here. Editor & Publisher profiled Scott in 1952. Lambiek said, "Scott drew the Sunday pages of Captain Easy as an assistant to Les Turner." On May 4, 1956, the Plain Dealer announced the return of the Doonks, to its Sunday paper, in the strip The Little People. According to the Plain Dealer, an exhibition of The Little People artwork was displayed at the Peninsula Public Library from December 6 to 31, 1970. Scott passed away on December 17, 1970 in Rocky River, a western suburb of Cleveland. Retired at the time, he was survived by his wife, three children, two siblings, ten grandchildren and two great-grandchildren. The Grand Comics Database has a list of his comic book credits. Edward L. McCullough was born in New Jersey in 1901, according to the 1910 U.S. Federal Census. He was the youngest of three sons born to Charles and Catherine. They lived in Bayonne, New Jersey at 579 Avenue E. His father was a traveling salesman. In 1920 McCullough lived with his mother, a widow, and second oldest brother, Harold. They lived in Bayonne at 44 West 42nd Street. He was a newspaper cartoonist. McCullough created Embarrassing Moments for the Chicago Tribune Newspapers Syndicate, and produced the weekly comic strip Folks in Our Town for the Publishers Autocaster Service, Inc. They were followed by his strip Good Scout Andy in 1925. In 1926 he was elected third vice-president in the newly formed American Association of Cartoonists and Caricaturists. McCullough passed away on May 21, 1928. The New York Evening Post (New York) reported his death the following day. Edward L. McCullough, cartoonist, died today of pneumonia at his home, 44 West Forty-second Street. He was twenty-seven years old. Surviving him are his widow and a two-year-old daughter. Mr. McCullough was the originator of several comic strips which were syndicated widely. His best known works were "Embarrassing Moments" and "Folks in Our Town." 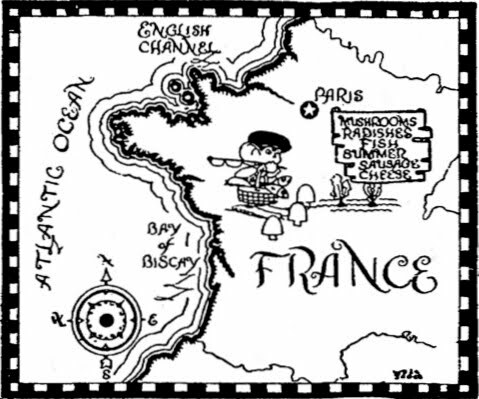 After receiving his education in the public schools of Bayonne he made cartoons for local newspapers. Later his comic strips appeared in the Chicago Tribune, the New York World and other papers.